The principal focus here is on autoregressive moving average models and analogous random fields, with probabilistic and statistical questions also being discussed. 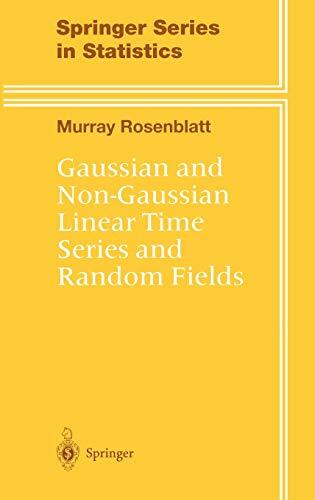 The book contrasts Gaussian models with noncausal or noninvertible (nonminimum phase) non-Gaussian models and deals with problems of prediction and estimation. New results for nonminimum phase non-Gaussian processes are exposited and open questions are noted. Intended as a text for gradutes in statistics, mathematics, engineering, the natural sciences and economics, the only recommendation is an initial background in probability theory and statistics. Notes on background, history and open problems are given at the end of the book. "...will make this book useful as a reference source to the more theoretical among time series specialists." "This publication can be recommended to readers familiar with the basic concepts of time series who are interested in estimation problems in nonminimum phase processes." 1 Reversibility and Identifiability.- 1.1 Linear Sequences and the Gaussian Property.- 1.2 Reversibility.- 1.3 Identifiability.- 1.4 Minimum and Nonminimum Phase Sequences.- 2 Minimum Phase Estimation.- 2.1 The Minimum Phase Case and the Quasi-Gaussian Likelihood.- 2.2 Consistency.- 2.3 The Asymptotic Distribution.- 3 Homogeneous Gaussian Random Fields.- 3.1 Regular and Singular Fields.- 3.2 An Isometry.- 3.3 L-Fields and L-Markov Fields.- 4 Cumulants, Mixing and Estimation for Gaussian Fields.- 4.1 Moments and Cumulants.- 4.2 Higher Order Spectra.- 4.3 Some Simple Inequalities and Strong Mixing.- 4.4 Strong Mixing for Two-Sided Linear Processes.- 4.5 Mixing and a Central Limit Theorem for Random Fields.- 4.6 Estimation for Stationary Random Fields.- 4.7 Cumulants of Finite Fourier Transforms.- 4.8 Appendix: Two Inequalities.- 5 Prediction for Minimum and Nonminimum Phase Models.- 5.1 Introduction.- 5.2 A First Order Autoregressive Model.- 5.3 Nonminimum Phase Autoregressive Models.- 5.4 A Functional Equation.- 5.5 Entropy.- 5.6 Continuous Time Parameter Processes.- 6 The Fluctuation of the Quasi-Gaussian Likelihood.- 6.1 Initial Remarks.- 6.2 Derivation.- 6.3 The Limiting Process.- 7 Random Fields.- 7.1 Introduction.- 7.2 Markov Fields and Chains.- 7.3 Entropy and a Limit Theorem.- 7.4 Some Illustrations.- 8 Estimation for Possibly Nonminimum Phase Schemes.- 8.1 The Likelihood for Possibly Non-Gaussian Autoregressive Schemes.- 8.2 Asymptotic Normality.- 8.3 Preliminary Comments: Approximate Maximum Likelihood Estimates for Non-Gaussian Nonminimum Phase ARMA Sequences.- 8.4 The Likelihood Function.- 8.5 The Covariance Matrix.- 8.6 Solution of the Approximate Likelihood Equations.- 8.7 Cumulants and Estimation for Autoregressive Schemes.- 8.8 Superefficiency.- Bibliographic Notes.- References.- Notation.- Author Index.